HH level audience planning/buying, Targeted TV is ready for the future. Targeted TV specialist Centriply, announced a collaborative effort with Experian to help brands maximize their linear TV campaigns. The agreement between the two integrates Experian’s ConsumerViewSM audiences with prospects and TV inventory data, brands can create meaningful interactions with valuable TV audiences at the household, local or national level. with the scale of Linear TV to reach audiences for growth. Tying anonymized data and brand safe TV inventory together enables planners to identify the most valuable TV audiences with precision at a household, local or national level. Paired with digital campaigns to create a common ground for growth and profitability, the additional scale of Linear TV can create the extended reach, and impact, that brands and advertisers are seeking. Safe, cross screen application of de-identified audience data segments intensifies the impact of a campaign, HH level data drives planners to compare inventory, viewing patterns, and location while Centriply compares costs for the best media opportunities. “This is all part of our effort to bring a ‘frictionless’ planning process into the media buying marketplace. We have significant investment in our technology, and our staff, who look forward to bringing the benefits of cross screen data and metrics to our clients.” Lewis explained. “We’re pushing our platform to provide answers to the question; what does the potential of TV look like in the future? 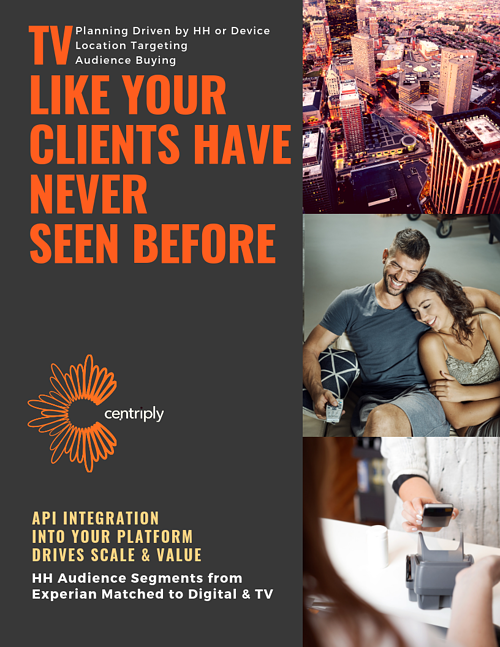 Centriply’s Targeted TV marketing will improve the experience and abilities of planners and buyers of media all across the TV industry.” Holasek concluded. This integrated service paves the way for even more layers of information to be applied to audiences, location and inventory with accuracy and richer detail than can be achieved with traditional approaches and at a scale that adds to addressable and OTT. The Centriply team is pushing to accelerate the transformation of cross screen marketing. Consider us a TV Audience Search Engine. Just click the orange button to request your own Targeted TV report with HH Audience segments.